RESPECT. Interview: Laiken Joy Takes Her Own Shot of New Orleans With Confidence and Jet Life | RESPECT. Laiken Joy Thigpen is a 26-year old photographer based in the soulful city of New Orleans. Growing up between Nashville and Lake Charles, La, she fell in love with photography at a young age. She has an eye for raw beauty and is known for her bright, crisp photographs of people and places. With a versatile style of her own, you can always count on her when it comes to visuals. 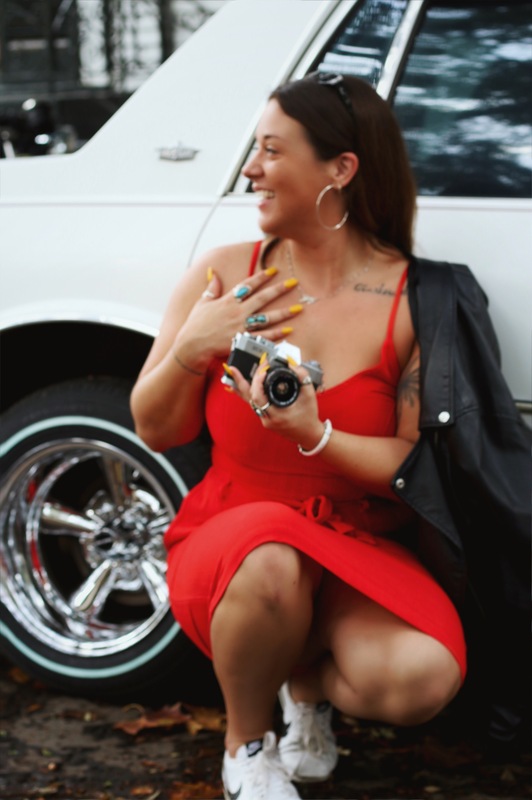 Laiken is the official photographer for DJ Kelly Green, of Jet Life Recordings, and has a thriving resume, including OffBeat Magazine, Curren$y, New Orleans Jazz & Heritage Festival, and more. She works alongside many local brands and creatives and enjoys bringing their visions to life. Having combined her passion for photography with travel, Laiken has been to more than 25 countries and loves learning about other cultures whilst documenting the worlds outside of her own. With big plans, Laiken stays true to the reason why she began taking photos in the first place, to connect, inspire and remember. RESPECT. : Where are you from? Laiken: I was born in Lake Charles, La. RESPECT. : What inspired you to get into photography? Laiken: I’ve been into photography since I was very young and just because I felt like no one around me was taking photos. I guess with my family and growing up with my friends, I was like, I want to be the person that capture these memories. That is kind of how it started, and I got to fashion, and I got into concerts and just worked my way up but still if you pay attention to my work, you could still see the reason why I started. It was ultimately to capture people being them true selves whether it is at a concert or you are just hanging out with your friends. That was just to make people feel good about themselves. You know you show a person a picture of themselves and it could change their whole view of how they think about themselves which is tight. RESPECT. : Absolutely, give them some perception. Laiken: Yes, for the positive people you know don’t see how beautiful they are in their natural state. Especially in the world that we live in now, we know of people that want to be something that they are not, and I think that is important to get back to who you are and express that. RESPECT. : Around what age did you first get started? RESPECT. : What made you decided to take a turn into capturing hip-hop moments? Laiken: A lot of my friends growing up in Antioch wanted to be rappers. I was the photographer. I would shoot good at concerts. I shot for my homeboys first concert some of their first photo shoots and music videos. Hell, I shot my first music video for my homeboy C Blue and I used the lights of my car because I didn’t have a flash. I couldn’t afford a flash at time. It just was who I was around at the time. I love the whole hip-hop culture. RESPECT. : Having an eye for photography is it one of those things that you must be patient when it comes to finding the right picture or does it come natural to you? What makes a good picture? Laiken: I would say it comes natural because right now I’m going through photos. Today, I had a photoshoot and took about 400 photos and narrowing them down I’ll probably choose 100 because I like all of my photos. For me what I think makes a good photo is being able to show you exactly what I saw in that moment. Certain things I can see visually and I’m like wow I want to be able to capture this moment. If I see something, then I’m like that’s it right there that will explain to you that was going on in that exact time whether it is was staged shoot or not. RESPECT. : How long does a normal session take? Laiken. : I’m quick, I’ve been told. Today it took about two hours that because I had a shoot with four girls, and you know how that goes. *laugh* I would so know more than about an hour typically. I guess it just depends on what it is too. RESPECT. : I see that you are the official photographer for DJ Kelly Green from Jet Life, that’s Curren$y label. As well working with Curren$y, you have worked the New Orleans Jazz Heritage Festival. What would you say would be your favorite moments working at these times? Laiken: I shot Jazz Fest with DJ Kelly Green and that was my first festival that I’ve ever shot. That wasn’t just me sneaking in my camera and being on stage and seeing the energy and the influence, she’s really fun. A lot of people will tell me “shooting a DJ, that doesn’t sound fun ” but she has too much personality and style. It was cool to be on stage and see all these people who came for this one person. The energy is insane when you’re on stage. It’s like nothing that I’ve ever experienced from a crowd. RESPECT. : When you taking picture of artists, what is one thing that can capture their charisma from a fan’s perspective? What is one thing as you as the photographer can capture to help the fan understand the artist’s artistry? Laiken: I would say the shots that they don’t mind taking on canvas. I have a way of making people comfortable in front of the camera when I’m behind it. I feel like just the canvas that I take. I’ve had people tell me thank you for taking pictures of Spitta because we really don’t know what he’s up too and we are big fans. I don’t why because he posts a million pictures a day. I get a lot of appreciation comments because they see things that most people don’t see. Most photographers are looking to show you not necessarily their perspective but the perspective of the artist. If that makes sense. I want you to see what I see. I don’t want you see the artist vision unless it’s a collaboration. RESPECT. : Working with Curren$y did you ever get to catch any Sunday night cruises? Laiken: Oh yea, always on the Sunday nights they are a blast. RESPECT. : I see him and Wiz Khalifa have been prepping the ‘2009’ campaign, the Jet Life apparel just dropped last month and a few other products. What are some cool things that you’ve done learned and gained experience? RESPECT. : Guaranteed having to go through a lot of smoke and mirrors but it’s good when you find someone in their true form. Just be yourself, that’s the golden rule just be yourself. RESPECT. : What would you say your personality is like in three words? Laiken: I’m open-minded, very cheesy I’m not going to lie *laugh* and interesting. I also get excited about things especially when I have a vision. RESPECT. : Enthusiasm, that’s a good way to put it. RESPECT. : I see you went to 25 different countries. Getting a chance to travel outside of the United States, what are some great experiences that you’ve seen that helped you with your journey? What are some things that you have learned as far as culture? Laiken: Two countries that stand out to me when I think of life changing are the island of Bali in Indonesia and Havana, the city in Cuba. They kind of go hand in hand because they are two places that people are dying to see but I don’t think people really see them. They want to take the pretty pictures and they want to act like they are doing all of this but those two places I got to really get out and meet people. Both places, I spent two full weeks with families from there and you really see what it is like. In America, we have everything handed to us. People don’t realize having a cell phone is a luxury. It’s not a necessity. Whenever we are factoring in our bills, it’s not a necessity, it’s a luxury. The internet is a luxury. Netflix, $7.99 is a d**n luxury. Both of those cities put s**t in perspective for me on just how blessed I am. At the end of day, it’s not about material things that simplicity is always going to make you happier. RESPECT. : What would you say would be one of the things that you feel like is your purpose as far as photography? Laiken: Making people feel good about themselves and to inspire people to just go after it and to do it your way. A lot of people think they have to mold and bend over backwards and change who they are. If you just do it your way and have faith in yourself, I think that you can accomplish anything that you want to. That’s one thing that I want people to know that you can do. That’s why I do the work my way. You’ve seen my work obviously. Sometimes my photos are blurry, and people would be like oh they’re quality. Yeah but I can feel that moment. It doesn’t matter if you can. I just want people to know that you can do it your way. RESPECT. : Do you have any advice for aspiring photographers? Laiken: Really love what you’re doing and know that a price on a camera doesn’t matter. Your eyes are the most valuable things that you have as a photographer. You can make anything else work. Rely on your eyes at all point. Don’t get discouraged because you don’t have a $4000 lens. S**t, I’m paying a loan on a lens right now. RESPECT. : It doesn’t come overnight. The price of success, it doesn’t come overnight. Laiken: No, it does not. Who really wants it to come overnight? If it comes overnight, then it usually leaves overnight. RESPECT. : What do you planned for 2019? Laiken: I’m shooting a music festival. I’m excited about that. I’m shooting Buku Festival. I’m having my second solo photo exhibit but my first in New Orleans, I’m very excited about that. Also, I have some cool projects with some dope brands over the next couple of months too. RESPECT. : Could you tell me what is the perfect day to you? Laiken: Waking up early like 7 o’clock, putting some coffee on, walking the dog, getting s**t done and not hitting traffic. Having a full day going to the gym, editing some photos, and then winding down at the end of the night with a joint and a good Netflix movie. RESPECT. : What does the word RESPECT. mean to you? Laiken: The definition of Respect is really putting on for yourself in a way that doesn’t take away from who you are. I also want to say showing love to people for who they are too is a lot of respect. Respect is something you don’t have to say that you do, it just understood.